When you want a more formal, sit-down event for your wedding reception, anniversary party or other celebration, Pongal Event Center can accommodate you. We have event space to comfortably seat a multitude of people. We have party supplies for rent that include table linens, chair covers and ceiling treatments to match your color scheme. Our facility is ADA-compliant, easy to find and offers ample parking. Our large windows and outdoor balcony provides breathtaking views of the Sandia Mountains for stunning photographs. 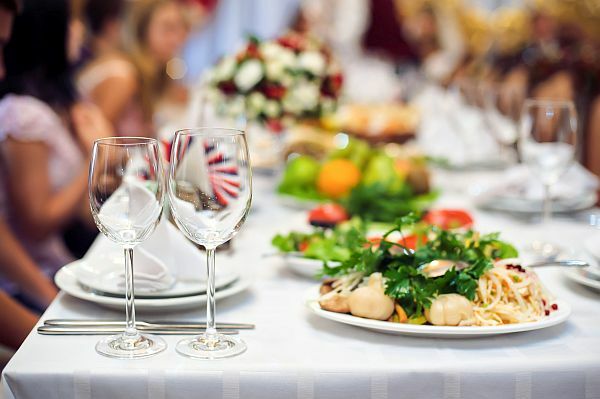 If needed, we can provide recommendations for local companies with excellent reputations to provide food, entertainment and decorating services. We also have an experienced event planner who can help you as much or as little as you choose. Pongal Event Center has competitive event venue rental rates and customizable package deals. We strive to offer the best value for your celebration. For details and to book your banquet reception, contact Tom, our event coordinator or Jef, our Planning Pro.